Philip Henry Niekro Jr. was born in Blaine, Ohio, on April Fools’ Day — April 1, 1939. That was appropriate, for he spent much of his career fooling batters with a pitch that most other pitchers wanted no part of. Two daughters, Apolonia and Anna, were born to the couple before they moved about 75 miles north, to the small town of Blaine. It was in Blaine, in early 1913, that Jozef and Maggie had their only son — Philip Henry Niekro. “Actually, our name was spelled Niekra in Poland, but here, we got the ‘o’ on the end,” said Phil many years later.2 Life was not easy in the coal-mining community, but it was especially difficult for Philip — both of his parents died before his fifth birthday. The community saw to it that he was taken care of, and he attended elementary school and began high school before starting work in the mines at age 15. Philip married Henrietta “Ivy” Klinkoski, herself the orphaned daughter of Polish immigrants, in 1936, and they had their first child, a daughter, Phyllis, the next year. Two sons, Philip Henry Jr. and Joseph Franklin, would follow. By the early 1940s, the Niekro family had moved to nearby Lansing, Ohio, about seven miles west of Wheeling, West Virginia. 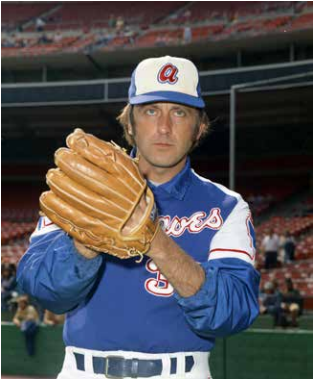 Phil Niekro Sr. played baseball on the sandlots of the coalfields, in the Mine Workers League. After arm trouble took away his fastball, a co-worker showed him the knuckleball. “A fellow named Nick McKay, who was in the minors for a while, showed me how to throw it. It was all I could throw,” he told a writer.3 In Lansing Phil Sr. would play catch with his children. He taught the knuckler to his oldest son, 8-year-old Phil Jr. Phil practiced all he could, with sister Phyllis as his backyard catcher. After a while, Phil found another catcher, his boyhood pal John Havlicek. John would go on to his own Hall of Fame career with the Boston Celtics of the NBA. The Braves sent Niekro to one of their other Class-D clubs, the McCook Braves in the short-season Nebraska State League, where he pitched in 23 games, all in relief. His work was a little better there; walked fewer batters in more innings, and his ERA was a more than respectable 3.12. After making it through his first pro season, Niekro began climbing the ladder of the Braves system — Jacksonville, Austin, Louisville. In each city, he posted solid, but not spectacular, seasons, but he made progress at each stop. Niekro arrived at camp in 1964 without much fanfare, but he quickly stood out and Milwaukee Braves manager Bobby Bragan decided to add him to his Opening Day staff. Niekro made his major-league debut in San Francisco, in the second game of the season. At last, the coal miner’s son from Ohio could call himself a major leaguer! NIekro saw regular work out of the bullpen for the first month of the season. On May 17, the club sent Niekro down to Triple-A Denver, with some new instructions — “be a starter.” He finished the season in Denver, and his 172 innings pitched were by far the heaviest workload he had ever had. With Warren Spahn having been sold to the Mets during the offseason, Niekro had every reason to think he might take over a starting spot in the Braves’ 1965 rotation, but a strange thing happened in spring training. After succeeding as a starter the previous summer, the Braves moved him back to the bullpen. On May 13 in Pittsburgh, Niekro was brought in to start the fifth inning and finished the game, during which the Braves rallied for a 5-4 win. Along with his first major-league victory, he also collected his first big-league hit. Ten days later, on a United Airlines charter flight from Milwaukee to San Francisco, Niekro turned to his friend Gene Oliver and said, “I’m going to marry that girl.” That girl happened to be Nancy Lee Ferrand, a stewardess from California. With more crew aboard than were needed, Nancy was told she could have the night off. She looked around and took one of the only available seats — next to Niekro. The two sat together and played gin rummy all the way to California. “One of us won two million dollars. I think it was Nancy,” said Phil. Neither Phil nor Nancy remembered to get the other’s address or phone number, but Nancy’s mother suggested that she send Phil a letter, in care of the ballclub. She did, and they corresponded for 11 months, rarely seeing each other, until the middle of the next season. When Phil reported to spring training in 1966, it wasn’t with the Milwaukee team — the Braves had relocated to Atlanta. By Memorial Day, he had pitched only 20⅓ innings in 13 games, and in early June he was sent to the Braves’ new Triple-A team in Richmond, Virginia. Niekro appeared in 17 games for Richmond, four as a starter, and felt he was gaining even better control of his knuckler. He also accomplished something else on his agenda. When the US airlines went on strike in July, Nancy was stuck in California with no work. Phil suggested she buy a one-way train ticket and come to Richmond. It may have been a dandy wedding gift for the Niekros, but the win didn’t do much for Bobby Bragan. It was the last game of Bragan’s major-league managerial career. The Braves fired him the next morning, and replaced him with coach Billy Hitchcock. For Niekro, however, that was the end of his minor-league career, and he never went back. The Braves entered 1967 with high hopes, but while the team struggled to a 77-85 record Phil found himself back in the starting rotation by the middle of June. It was a breakout season for Niekro, and he ended the season with an 11-9 won-lost record, 10 complete games, 207 innings pitched, and a league-leading 1.87 ERA. The other big story of 1967 — especially to the Niekro family — was that of Phil’s younger brother, Joe, making the Chicago Cubs Opening Day staff. But it wouldn’t be until 1973, when Joe joined Phil in Atlanta, that Joe would take up the knuckleball in earnest. The next decade was pretty lackluster for the Braves, with the team posting winning records in only two seasons, and only Hank Aaron’s pursuit of Babe Ruth’s career home-run record adding much excitement. Two events stood out in the 1973 season for Niekro, however. Everything fell into place on Sunday, August 5, when Niekro threw a 9-0 no-hitter at home against the San Diego Padres. Two days later, the Braves picked up brother Joe on waivers from the Detroit Tigers. Phil and Joe had always dreamed of playing on the same team together, and now their chance had come. The 1977 club was the Braves’ worst team in more than 40 years. An old adage says, “A pitcher has to be pretty good to lose 20 games!” Well, Phil was pretty good, going 16-20 to lead the league in losses, but he also led the National League in innings pitched, complete games, and strikeouts. After the season, the Braves dismissed manager Dave Bristol, and, on the list of candidates to replace him, one name stood out — Phil Niekro. “They were looking for a manager. I knew the game and the players, so I threw my name in.”13 Instead, they handed the reins to Yankees coach and former Braves farmhand Bobby Cox, for his first major-league managerial job. After a 50-56 finish in the strike-interrupted 1981 season, Cox was let go, and Knucksie again expressed his interest in the position. “By that time, Ted Turner and I had become very close friends, and he made it known to me that I would someday be managing his team.“15 But it didn’t happen. The job went to former Braves catcher Joe Torre, who had just been dismissed by the Mets. The next season, 1982, was a bittersweet one. A spring-training injury caused Niekro to miss being a part of the Braves’ terrific start, winning their first 13 games. He didn’t make it onto the roster until game number 15. He finished the season at 17-4; his .810 winning percentage was the best in either league. The Braves passed the Dodgers during the last week of the season to capture the NL West flag. Niekro pitched two complete-game shutouts during that stretch, Knucksie’s own two-run, eighth-inning home run against the Padres sealing the clinching game for the Braves. Phil started Game One of the NLCS in St. Louis, and was ahead 1-0, but the game was called due to rain with two outs in the fifth inning. “We had to play it again from the beginning the next night. We ended up losing that game 7-0.” Niekro then started Game Two, and led 3-2 after six innings. “I was pitching well in St. Louis. I had ’em where I wanted them, and Torre pinch-hits for me,” said Niekro. The Braves ended up losing the game, 4-3, then moved back to Atlanta, where the Cardinals completed the three-game sweep. It was to be Niekro’s last postseason chance with the Braves. Niekro’s record fell to 11-10 in 1983. His 201⅔ innings pitched were the fewest for a full season in his career, his walks were up and his strikeouts were down. The sentiment by many in the organization was that Phil was at the end of his career. Knucksie may not have been the same pitcher he was a few years ago, but he was still just about the best that the Braves had. Phil felt that he still had two or three years left, and that 300 victories were certainly within his reach — he already had 268. By season’s end, Phil, at the age of 45, had led the Yankee staff in innings pitched and in wins with 16. The Braves finished under .500 in 1984; their top pitcher, Pascual Perez, won only 14 games; and manager Joe Torre was shown the door at the end of the season. In 1985, Phil set his sights on repeating his 16-win total from the previous season — that would give him 300. But it wouldn’t be easy. He won his 15th game of the season and 299th of his career on September 8, and knew that he had five more scheduled starts. On September 15, the Yankees made a trade with the Houston Astros, and brother Joe joined Phil in the Bronx. The quest went down to the last game of the season, at Toronto, and Phil took the mound in Toronto, while thinking of his father, seriously ill in a Wheeling hospital. Phil didn’t know that Yankees owner George Steinbrenner had hooked up a radio play-by-play of the game on the phone to Phil’s mother at the hospital. With that victory, Phil Niekro became not only the 18th 300-game winner in major-league history, but also the oldest pitcher ever to record a shutout. After returning home, and with the Braves once again looking for a skipper, Phil fully expected to hear from Ted Turner. “Ted’s pledge that I would someday manage his ball club just kept rolling around inside my head,” he said.24 The Braves didn’t say no; they didn’t say anything. Phil never heard from the team, which chose to go with Chuck Tanner. At this point, Phil turned his attention to working with brother Joe in passing Gaylord and Jim Perry in career victories by two brothers. Joe and Phil stood at 504, the Perrys at 529. Although the Yankees signed Phil again for the 1986 season, and in spite of a good showing in spring training, he was released on March 28, the club citing his age as the reason. Phil ended up signing with the Cleveland Indians, and his 11-11 record showed that he still had a little bit left. Joe picked up nine wins with the Yankees, their combined total of 524 still five short of the Perrys. Another member of the Niekro family also joined the professional baseball family that summer, when the Indians drafted and signed left-handed pitcher Philip Dillmore, son of Phil and Joe’s sister Phyllis. Finding themselves hopelessly out of the race, the Indians traded Niekro to the Toronto Blue Jays on August 9. He was back in a pennant race! Writers around the country paid tribute to Niekro, most surmising that his career was over, and lamenting that he never got a shot at the World Series. In Atlanta fans wondered if the Braves might sign Phil, giving him a chance to end his career with his original team. That was exactly the way Knucksie wanted to finish, but he was confused and a bit hurt by some of the negative reception that the idea received in the press. Discussions with the Braves wavered back and forth for about two weeks, and on September 23 the team finally announced that it had signed Niekro to a $1 contract, and that he would start the final home game of the season. On Sunday afternoon, September 27, 1987, the Braves unretired number 35, and Phil Niekro took the mound against the first-place San Francisco Giants. Things went well for three innings, but the top of the fourth was not kind to Phil. The Giants scored two runs and loaded the bases before manager Chuck Tanner came out to remove him. Niekro protested, to no avail, but the manager had already decided that he would not let Phil get into a position to lose the game. Tanner and Niekro walked off the field with the Braves holding a 5-2 lead. Reliever Chuck Cary faced pinch-hitter Candy Maldonado, who homered to deep left-center field, giving the Giants a 6-5 lead. The final score was 15-6. Phil and Joe finished their careers with a total of 539 wins. In January 1993 Phil was on the Hall of Fame ballot for the first time, and his chances for election looked good. After all, every other 300-game winner had already been enshrined. When the ballots were counted, Niekro was named on 65.7 percent of the ballots, falling 40 votes short of being elected. The baseball world was surprised in December 1993 when the Coors Brewing Company announced that it would sponsor an all-women’s baseball team, the Colorado Silver Bullets, with Phil Niekro as their manager, and son John and brother Joe as coaches. "Women should have every opportunity to play competitive professional ball," he said. "I think we are going to surprise quite a few people with the ability of these athletes and the caliber of ball they can play. "28 Although the team was not a success on the field, it gained respect and recognition for its pioneering achievements. The Silver Bullets played for four seasons before Coors ended its sponsorship. Phil was finally elected to the Baseball Hall of Fame in 1997, his fifth year of eligibility. He has been one of the more active and visible Hall of Fame members since his enshrinement, serving on the Hall’s Board of Directors and as a member of the Veterans Committee. He has also been an ardent participant in the shrine’s Hall of Fame Classic weekend, serving as one of the team managers for several seasons. Niekro was chosen to receive the Lou Gehrig Memorial Award in 1979, and the Roberto Clemente Award for outstanding community service in 1980. He continued to be active in charitable endeavors in the Atlanta area. Phil and Nancy moved to their retirement home on Lake Lanier, north of Atlanta, their three sons — Philip, John, and Michael — already grown. Phil remained active in baseball, and has become somewhat the “Godfather of the Knuckleball,” mentoring such pitchers as Tim Wakefield, Steve Sparks, and R.A. Dickey. He also instructed his nephew, Lance, who gave the knuckler a trial in the minor leagues after spending parts of the 2003-2007 seasons as a first baseman with the San Francisco Giants. Years from now, someone walking through Saint Anthony’s Cemetery in Blaine, Ohio, may wonder about the tombstone for Ivy and Phil Niekro Sr., the one with a baseball on the top, inscribed with the number 539. Anyone who knows the story will understand that it was truly a family affair. Atlanta Braves Media (Press) Guides 1966-2015. Binette, Wilfrid. Knuckler — The Phil Niekro Story (Atlanta: Hallus, Inc., 1970). Caruso, Gary. The Braves Encyclopedia (Philadelphia: Temple University Press, 1995). Shatzkin, Mike. The Ballplayers (New York: Arbor House-William Morrow, 1990). Thorn, John, Pete Palmer, Michael Gershman, David Pietrusza, and Dan Schlossberg. Total Braves (New York: Penguin Books, 1996). Van Wieren, Pete, and Jack Wilkinson. Of Mikes and Men (Chicago: Triumph Books, 2010). Fraley, Gerry. “Niekro Agrees to Start for Braves Against Giants,” Atlanta Constitution, September 23, 1987: E-1. Shaw, Bud. “The Most Important Thing Was to Wear the Uniform Again,” Atlanta Journal-Constitution, September 28, 1987: D-1. YouTube.com - Phil Niekro, during his Induction Day speech at the National Baseball Hall of Fame, Cooperstown, New York (August 3, 1997). US Census Records — 1910, 1920, 1930, and 1940. Except where noted, all quotations are from the author’s numerous conversations with Phil Niekro between 1987 and 2017. 1 Staatsarchiv Hamburg. Hamburg Passenger Lists, 1850-1934 [database online]. Provo, Utah: Ancestry.com Operations Inc, 2008. Jozef Niekra, from Slodkow, Polish Russia, left Hamburg, Germany, bound for the United States, aboard the steamship Albano on August 28, 1901. On the ship’s passenger list, Jozef’s occupation was given as “arbeiter,” which translates as “worker.” Slightly more than a year later, 20-year-old Magdalena “Maggie” Mieszegr left her home in Blinow, Polish Russia, to go live with her brother Michal, near Fairmont, West Virginia, traveling from Bremen, Germany on the SS Brandenberg and arriving in New York on December 21, 1902. 2 “Phil Niekro Sr. Glad He Taught Sons the Knuckler,” Daytona Beach Morning Journal, June 17, 1979. 4 Ohio Valley Athletic Conference, ovac.org/HallOfFame/Details/49. 5 Bill Madden, “Niekro a Hit at Hall, No Second Banana to Dodgers’ Lasorda," New York Daily News, August 4, 1997. 6 National Polish-American Sports Hall of Fame polishsportshof.com/inductees/baseball/phil-niekro/. 7 Jack Wilkinson, Game of My Life — Atlanta Braves (Champaign, Illinois: SportsPublishingLLC.com, 2007), 47. 9 Curt Smith, What Baseball Means to Me: A Celebration of Our National Pastime (New York: Grand Central Publishing, 2002), 112. 10 Bob Wolf, “Phenom Foggy on His Name — Dazzler on Hill,” The Sporting News, April 25, 1964: 19. 11 Phil and Nancy’s marriage license was issued and signed by Thomas Royall Miller, clerk of the Hustings Court in Richmond. Miller had been an outfielder with the 1918-19 Boston Braves. 12 Wilt Browning, “Niekro a Two-Timer,” Atlanta Journal, August 9, 1966: 16. 15 Phil Niekro and Tom Bird, Knuckle Balls (New York: Freundlich Books, 1986), 21. 16 Jesse Outlar, “Niekro Leaving Braves,” Atlanta Constitution, October 7, 1983: 12. 17 Chris Mortensen, “Torre Ordered to Shun Niekro,” Atlanta Constitution, October 8, 1983: 1-C.
18 Chris Mortensen, “Niekro Needed Gibson’s Faith,” Atlanta Journal-Constitution, October 8, 1983: 6-C.
20 Associated Press, “Niekro Cleaning Out Locker Today; Brother Joe Blames Joe Torre,” Augusta (Georgia) Chronicle, October 7, 1983: 27. 22 “Atlanta Braves Salute Phil Niekro, Retire Jersey,” Gainesville (Florida) Sun, August 7, 1984: 3B. 24 Niekro and Bird, 190. 25 Phil and Joe Niekro with Ken Picking, The Niekro Files (Chicago: Contemporary Books, 1988), 68. 26 “Phil Niekro Released,” New York Times, September 2, 1987. 27 Dave Kindred, “One More Time Was Enough,” Atlanta Journal-Constitution, September 28, 1987: D-1. 29 “Hall of Fame Celebrates 75th Birthday With New Exhibits,” MLB.com, June 13, 2014.